Enjoy the world class amenities of Wild Dunes resort, just minutes from historic Charleston, from our centrally located cottage, overlooking the 1st hole of the Tom Fazzio 'Harbor Course'. It sits directly across from the resort's main swim, and tennis area and is just a short two block walk to the beach and Grand Pavilion/Boardwalk area. This cottage boast the most inviting porch on Wild Dunes with a constant low-country marsh breeze. Professionally decorated, the cottage has three bedrooms. The master has a king bed, private bath and opens to porch that overlooks a lagoon and the golf course. The other two bedrooms share a bath. One guest room has a queen and the other guest room has a full over full bunk bed with a full size trundle bed and opens to an outside deck that leads down to the lagoon. All beds have luxury 300 count cotton sateen sheets. Just perfect when you've had too much fun in the sun! The living room and dining room (with a table for eight) look out to the fabulous porch and are decorated in bright happy colors. 48' flat screen TV is High Definition . They offer a cool retreat on summer days or a cozy place to curl up with a good book. The kitchen boast all the utensils, appliances, and entertaining pieces you could ask for. 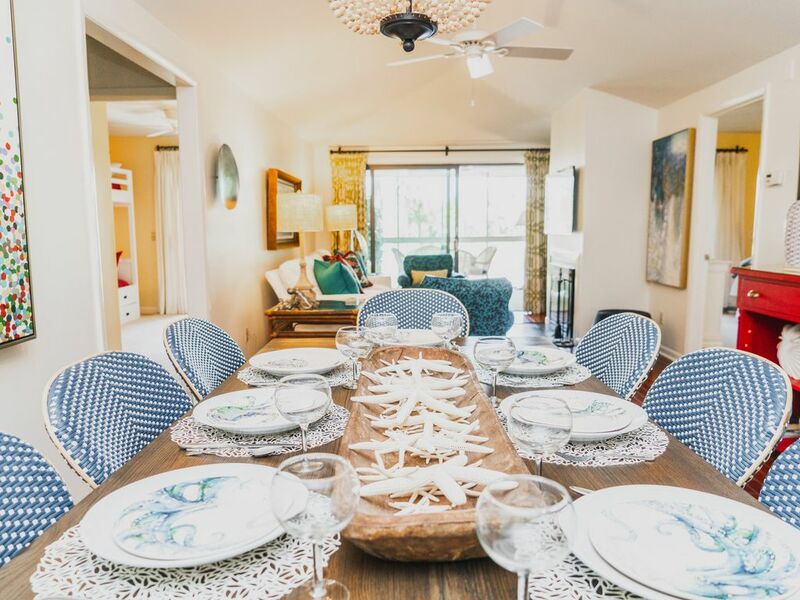 All the serving pieces compliment the decor of this darling cottage. Now for the porch (everyone's favorite!) It runs across the back of the cottage with a wicker dining table for four and the seating area has a loveseat, rocking chair, and chaise lounge. The nautical navy and white decor sets the mood for enjoying both morning coffee and evening cocktails with friends while relaxing with gentle island breezes. It is a favorite of all who stay here! Staying within the gated community of Wild Dunes, affords great relaxation for families of all ages. Whether relaxing on the beach, sipping cool island drinks up at the Grand Pavilion, or strolling along winding nature trails, there is something for everyone! Once you decide this is the cottage for you, the owners can direct you to the best places to rent bikes, beach toys, umbrellas, and chairs. All delivered directly to your doorstep. They have done all the research for the best deals on the island! My family hs owned this house for 35 years (Before Wild Dunes was called 'Wild Dunes' - It was Isle of Palms Beach and Racquette Club. It has been through Hurrican Hugo and came out just fine! We enjoyed our stay at Twin Oaks. The house is wonderfully located and is close enough to one pool you can hear the children playing. So convenient. We loved the screened in porch. Plenty of space for our family of 4. Beautiful surroundings in the Resort. We very much enjoyed our visit recently at 15 Twin Oaks. The home was well-equipped with kitchen utensils, towels, blankets, pillows, etc., and the beds are extremely comfortable. The sportscard that comes with the rental also gave us access to all the pools, one of which is walking distance. The golf cart made the beach and other pools very accessible, and the poolside bar and grill by the pool offered delicious food options. We are very pleased with the visit. We all enjoyed ourselves and will definitely come back to this lovely home. Our stay at the Twin Oaks cottage was just wonderful. Having use of the golf cart was such a plus and provided a chance to cruise around the resort and explore. However, the beach was within walking distance and the proximity to the pool was second to none! The beds and linens were very comfortable - I was excited to go to bed each night! The kitchen is extremely well stocked with every utensil you could ever need. We loved being able to have our doggie stay with us on vacation at this place. He was able to hang on the screened in porch and look at all of the golfers and jumping fish in the pond. He loved it! We would definitely stay here again. Great condo in a perfect location. Screened in porch is awesome. The back porch was our favorite part of the house. Great view. Turtles, an egret and golfers. The property was clean. Good kitchen. Living room furniture could be updated, currently not comfortable. Bed was good and decor was good. Nice layout overall. Construction going on near by so we hear a lot of trucks. Great walking and biking. The beach is fantastic! Just wanted to add that the sofa currently has all new cushions and is extremely comfy (they came in right after this guest left) I am guessing that is all she is talking about because the chairs are both new. Decor is lovely and one of the best stocked kitchens I have encountered. Just the Isle of Palms experience we wanted! The owner and her assistant are so very kind!